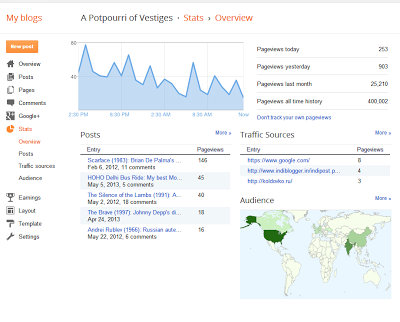 We are delighted to tell you that (by God's grace) A Potpourri of Vestiges has finally hit the 400,000 mark. It's been a long wait but one that has been worth it. 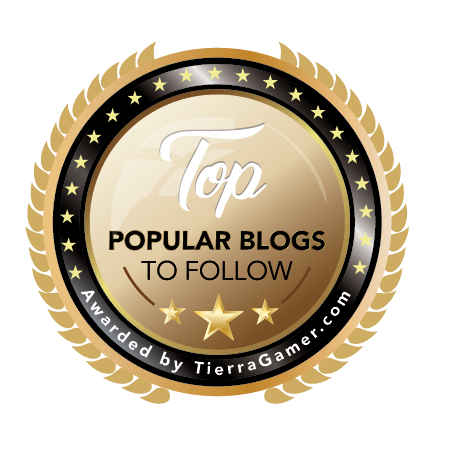 We would like to extend my sincerest gratitude to all our readers, friends and guest bloggers, who have been instrumental in making the blog a success. Based in India, operating since October 2011, A Potpourri of Vestiges is dedicated to the cause of propagating the power of cinema. What had started out as a mere means of self-indulgence has today blossomed in something significantly promising. Today, A Potpourri of Vestiges is a well-recognized movie blog. 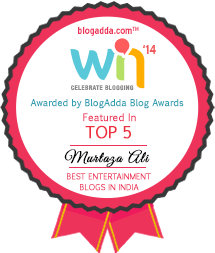 Indian top blogs showcased the blog in its eclectically chosen list of Top 60 Indian blogs for the year 2012. 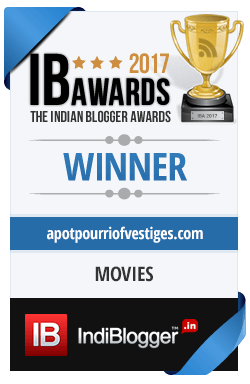 A Potpourri of Vestiges also features among the top blogs in the IndiBlogger network with an IndiRank of 80+ (on a scale of 100). 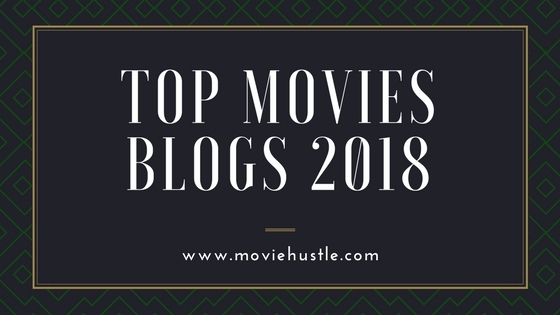 The blog is also enlisted on various major blogging directories/communities including the prestigious The LAMB (Large Association of Movie Blogs)—the world's largest film blog community. 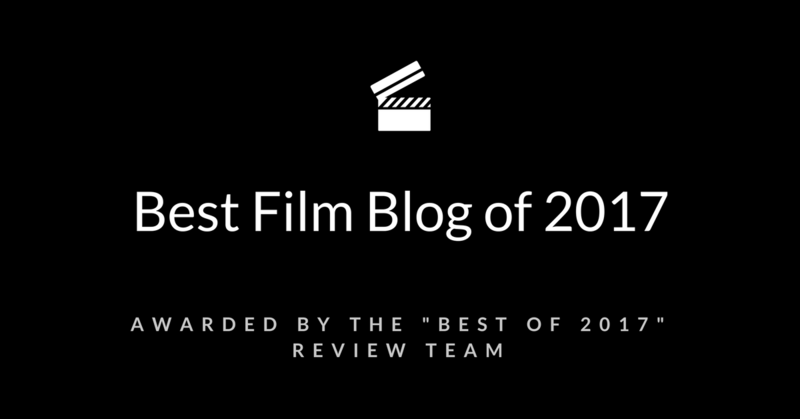 The prime focus of the blog is to highlight contemporary as well as classic cinema—foreign, independent, and cult—by analyzing movies through means of reviews, essays, critiques, etc. and by our coverage of major international award functions and film festivals. Today, we are fortunate to get zealous readers from all the nooks and corners of the globe. We have a strong and ever growing readership base, a healthy mix of masses and aficionados, uniformly distributed all across the globe. We also have a strong social media presence, with a considerably large number of followers and subscribers on facebook, google plus, twitter, and other platforms. 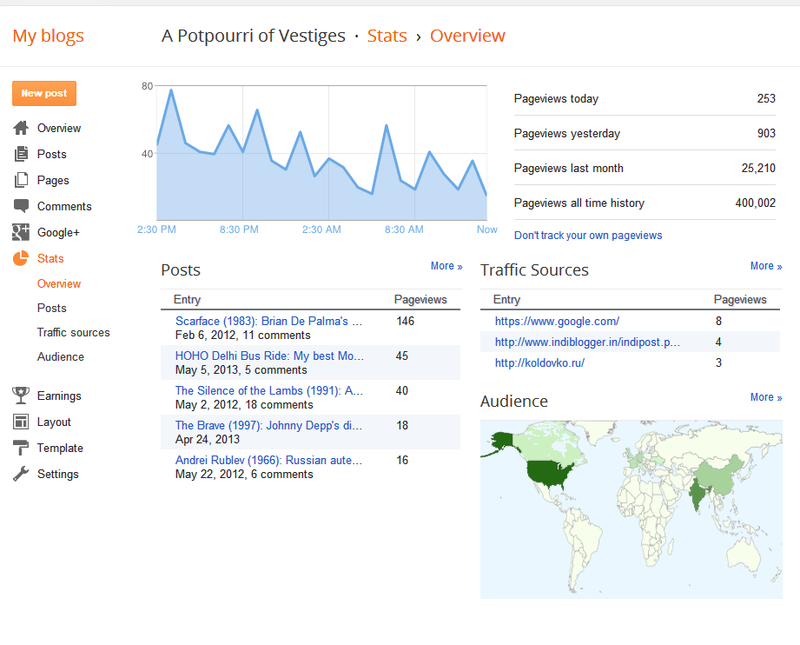 On an average, we get about 15,000 unique visits/month with a total of 25,000 pageviews/month. As we continue this amazing journey, we would like to offer my deepest gratitude to all those who have helped made it a reality: the fellow bloggers/cineastes at various blogging/social networking platforms, especially IndiBlogger, theLAMB, Pagalguy, Facebook, Google+, and Twitter. Congrats! Let your good work continue. Congrats, great site, one that shows Europe and North America don't have a monopoly on English language film writing. 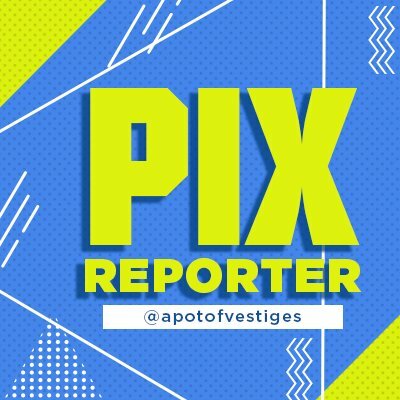 Congratulatipons!! That's a great achievement! congrats !! milestones achieved lot ahead to go God Bless !! Congrats Murtaza! Onwards and upwards my friend! 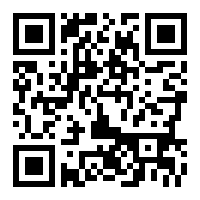 Super!! Deserve every bit of it!! A bigggggggggggggggggg congrats....!!!!!!! Way to go.